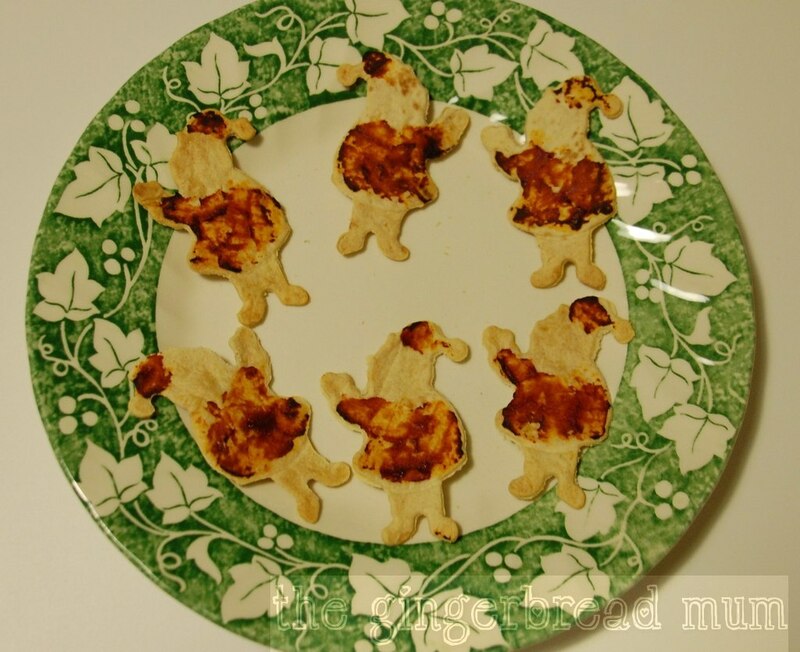 Baked tortilla crisps or chips are a healthy and very easy snack to make, and something your little ones can help you make. I was inspired to make these Christmas-themed crisps after seeing Grace’s snowflake tortilla crisps on Eats Amazing. We added some tomato puree to make our Santas jollier, but they’re just as yummy without it. For adults you could add some red by sprinkling on some chili powder, paprika or cayenne pepper. These would be great for Christmas parties as well as popping into lunchboxes. You can eat them on their own or use them to scoop up dip or salsa (we also like to dip them in soup!). Cut out shapes from the tortillas and lay them in a single layer on non-stick oven trays. Using the back of a teaspoon, smear on a little tomato puree for Santa’s hat and jacket. Bake for 5-7 minutes (keeping a close watch after 5 minutes) until the edges are starting to brown. Remove from the oven and leave to cool and crisp up more. What Christmas shapes would your munchkins love to eat? Posted in cooking with toddlers, family, snack, toddler and tagged Christmas, Christmas food, cooking with kids, Father Christmas, finger food, Santa, snack, tortilla chips, tortilla crisps. Bookmark the permalink.